Hurricane Sandy made landfall Thursday in southern Cuba, just west of Santiago de Cuba, where residents boarded over windows and cleared drainage gutters ahead of the strengthening storm that had roared across Jamaica and left two dead in the Caribbean. As of 5 a.m. ET, the U.S. National Hurricane Center said Sandy, which had strengthened to a category 2 hurricane, was located over southeastern Cuba and moving north at 18 mph, with maximum sustained winds of 105 mph and was expected to remain a hurricane as it moved through the Bahamas. The 18th named storm of the Atlantic hurricane season was expected to pass to the west of the U.S. naval base at Cuba's Guantanamo Bay, where pretrial hearings were being held for a suspect in the deadly 2000 attack on the destroyer USS Cole off Yemen. The military warned the 5,500 people living on the U.S. base to be ready for the storm. Officials said there was no threat to the 166 prisoners. 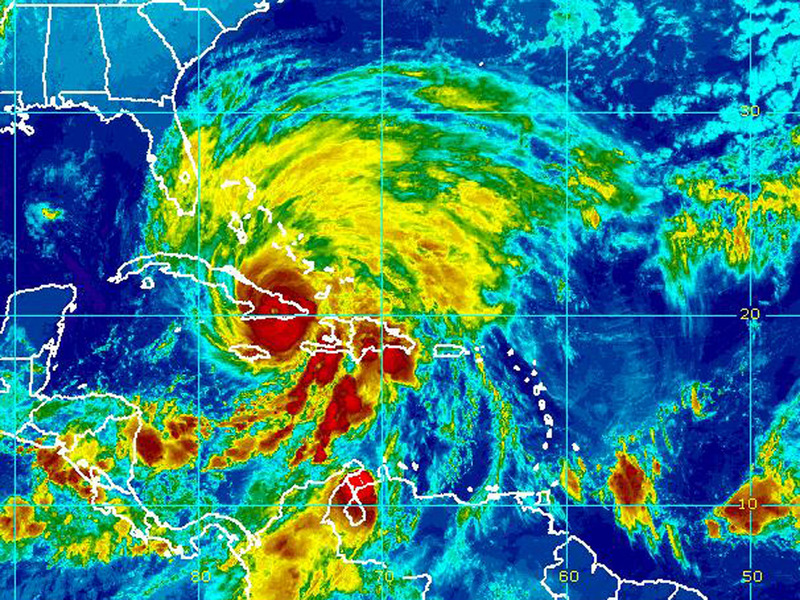 The hurricane center said that Sandy would leave Cuba Thursday morning and would pass over the Bahamas later in the day. It might bring tropical storm conditions along the southeastern Florida coast, the Upper Keys and Florida Bay by Friday morning. Early Thursday, the tropical storm warning was extended northward as far as Flagler Beach and a tropical storm watch was issued for the northeastern Florida coast. Cuba's Communist government, known for its quick response to natural disasters, announced the evacuation of about 450 tourists from beach resorts near Santiago, according to Cuban state media, though hotel workers told The Associated Press they were not expecting any major problems. Sandy "is a complex of strong rains, very intense," said civil defense Col. Miguel Angel Puig, adding that the rains could affect 200,000 people in Cuba. The hurricane center had said Sandy was expected to produce total rainfall of 6-to-12 inches across Jamaica, Haiti, Dominican Republic and eastern Cuba. "These rains may produce life threatening flash floods and mudslides, especially in areas of mountainous terrain," the center said. Eastern Cuba is mountainous and home to independent and state farms growing yucca, sugar, corn, coffee and fruit, among other crops. Fishermen on the Gulf of Guaranayabo, where Manzanillo is located, moved their boats to safer ground. People in Manzanillo, a city of 132,000 some 465 miles east of Havana, said they were worried about the impact, particularly after a wet summer that left sub-soils saturated. "Given the condition of my house, I don't know if it will withstand the force of a hurricane, but we are prepared," said Emiliano Lopez, a 62-year-old who lives near Manzanillo's seaside boulevard. In Santiago, Cuba's second largest city, heavy rain was already falling late Wednesday night. "We're well prepared for the storm," said Mayte Cuesta, an employee of the Hotel Melia Santiago. "It will affect us, but we don't think there is any danger." As Sandy crossed over Jamaica on Wednesday, an elderly man was killed by a boulder that crashed into his clapboard house, police said. In southwestern Haiti, a woman died in the town of Camp Perrin after she was swept away by a river she was trying to cross, said Marie Alta Jean-Baptiste, head of the country's civil protection office. Jamaican authorities closed the island's international airports and police ordered 48-hour curfews in major towns to keep people off the streets and deter looting. Cruise ships changed their itineraries to avoid the storm, which made landfall Wednesday afternoon near the capital, Kingston. In some southern towns on Jamaica, several crocodiles were caught in rushing floodwaters that carried them out of their homes in mangrove thickets. One big croc took up temporary residence in a family's front yard in the city of Portmore. Stranded business travelers and a smattering of locals rode out the Category 1 hurricane in hotels clustered along a strip in Kingston's financial district. Some read prayer books or novels, while others watched movies or communicated with loved ones on computers. Cris Hopkinson, a Toronto woman who was on a business trip, said she hoped to catch a flight off the island Friday once the stormy weather cleared. "For now, I'm just hoping that the glass in the windows doesn't shatter from the winds," Hopkinson said in the dining room of the Courtleigh Hotel. About a mile away, in the rough neighborhood of Grants Pen, where shops have been ransacked in the past during storms, a number of young men ignored the curfew, riding on bicycles or walking in small groups in the steady rain. Cecile Graham, a mother of two teenagers, said she was worried about the possibility of burglaries or looting at the small markets and shops that line the main road. "I hope that all the police are out and we won't have the looting that has taken place before," she said. Far out in the Atlantic, Tropical Storm Tony posed no threat to land. The storm had maximum sustained winds of about 50 mph and was moving east-northeast at 25 mph). Its center was 1,060 miles west-southwest of the Azores.